For the first time, the Tripura government has taken initiative for distribution of pulses through Public Distribution System (PDS) and Otherwise Welfare Schemes (OWS) at a highly discounted rate by availing the benefit of the allocation made by the Union Government. During the inauguration programme for distribution of pulses (mosur dal) in fair price shops at a rate of Rs 40 per kg, which is approximately half of the existing market price, was launched on Thursday at the Kshudiram Basu English medium school ground. 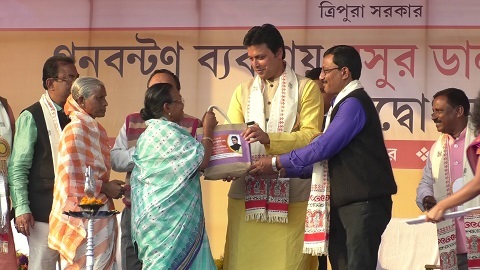 Chief Minister Biplab Kumar Deb inaugurated the programme by the distribution of packets of pulses among ration card holders in presence of Food and CS & CA Minister Manoj Kanti Deb; Debasis Basu, secretary, Food and CS & CA department of Tripura and other dignitaries. Tripura is the tenth state in the country to start such a programme under the Union Governments price support or price stabilization fund scheme which is effective from October 2018 and under which government of India released unprocessed masor dal for the state at a discounted price of rupees fifteen per kilogram for distribution through PDS, MDS, and ICDS. Chief Minister Deb said that the new government of Tripura unlike the previous government which was in power for 35 years and had taken the farmers from their fields to the roads for organizing protests have taken them back to the fields again with introducing minimum support price for their products (MSP). He added that Tripura is the first state of the Northeast India that has completed e-PDS system with Aadhaar authenticated sales at all fair price shops through point of sale machines and due to this huge number of bogus ration cards could be identified and canceled. Deb said that the State is working towards ensuring accurate targeting, transparent system and truthful utilization of the subsidy provided by the central and state government. Adding to the Chief Minister the Food and CS & CA Minister Manoj Kanti Deb added that computerization of PDS operation and digitisation of ration cards by linking them with Aadhaar around 62 bogus ration cards which enrolled 2.81 lakh fake names were canceled recently after the new government came to power and by this process the state and the central government could save Rs 5 crore every month. He added that the state government after pulses is working on providing soybean, mustard oil beside reintroducing sugar through PDS. The Minister also informed that the state government has decided to add another 131 fuel filling stations throughout the state for reducing the queue beside uniform distribution. Meantime, the gathered people at the inaugural programme expressed that they were very happy for the new initiative and which will surely benefit all.